Jangles is a joint venture run by Cath and Dave Jones. We take great pride in offering a home from home experience for our guests and go the extra mile to ensure that your dog has the best time possible during their stay. Each of our guests can relax on a variety of dog beds and sofas and for those who prefer their own space, we are happy to offer separate rooms. We have a large, totally secure outdoor area. Our guests are free to play and relax both indoors and out. In the summer, we spend a lot of time outdoors having fun with paddling pool and ball games. All daycare and boarding guests are exercised in accordance with owner’s wishes as far as possible. We offer a variety of group walks, to local woodlands and parks. All of our guests are issued with a Jangles collar which has our contact details and address clearly shown. Cath and Dave treat every dog as they do their own. Plenty of exercise, treats and an array of places to rest after being 'Jangled' including 2 very popular laps. Outstanding service. Rocky loves his walks with Cath and doggy friends in the works. First class home boarding With superb care. After being recommended by a friend I contacted Jangles about our much loved family pets, our son was due to marry and everyone would be at the wedding. Dylan and Max had only ever stayed with family and they were 12 and 7 years old, we were worried about leaving them but after a pre visit felt much easier about it. Well when our boys were dropped off they were fine they just seemed so excited to be there again and when we collected they had clearly enjoyed themselves. Cath and Dave are fantastic, our younger dog has severe IBD and will flare up with stress but he was fine and loved his stay. I wouldn't hesitate ever placing my much loved pet in their care, they are true dog lovers who clearly care for every four legged friend that stays or daily walks with them. Rupert my spaniel cross has been going to doggy daycare with Cath and Dave for two and a half years and he loves it! He gets very excited when I tell him where he is going. He has stayed overnight on a number of occasions too while I have been on holiday. He is always looked after just as well as I would look after him myself. He is loved, happy and cared for while in the care of Cath and Dave and that is all I could ever ask for. He is a very active dog and is exercised just enough by Jangles, sometimes he comes home and sleeps for hours - which was unheard of until he started daycare at Jangles. I have recommended Jangles to a number of people over the last couple of years. I would not leave Rupert with anyone else. Cath and Dave are lovely people who have a genuine love of dogs! I watch Cath's updates each day. It is so obvious the love and care these dogs get at Jangles. The perfect place for your precious pet. 5 star service by Cath and Dave dogs love going to them, always well looked after, home from home and very accommodating.Our old fella stayed with them many times and our new addition will do the same meaning more hols for all, excellant service. The very best in home boarding - the dogs are treated like royalty and always look forward to their stay with Kath and Dave. Five star hotel service all the way! Huey and Jack love staying with Cath and David at Jangles. They care about the dogs that board with them and the dogs they walk. I have complete faith when my boys are with them. Our dog stays with Cath regularly. Cath is absolutely fantastic with them and they love going with her. She keeps us all updated with photos and videos on Facebook of the dogs unjoying themselves. A 5 Star service!!! Top top notch!! 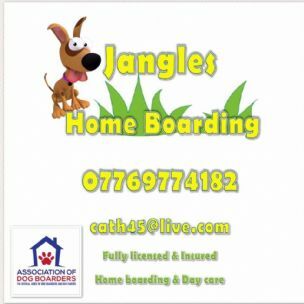 Jangles are a fabulous boarding service. Never left our dogs before but after being recommended by friend we decided to leave our elderly doggo and younger doggo with them. The younger of the 2 has IBD but Jangles looked after him so well! For a sensitive doggo he was not ill at all after! We were so happy to see the dogs playing and relaxed in their home. Would use again in a heartbeat!! Great Facebook page to follow to! Absolutely 1st class Homeboarding! Cath and Dave are amazing at what they do and I would never in a million years trust my much loved dog with anyone else! Can not recommend them enough! Can't recommend jangles headed by the AMAZING Cath highly enough. Super professional but more importantly super caring and companionate. Cath and her husband Dave the fave treat all dogs as if they are family and their own!! Jangles offer the full package is home from home!! Plenty of exercise, fun, games and lots and lots of love!! Alfie has stayed at Jangles with Cath Dave & the boys a handful of times now and the service provided is still as amazing as the first. I would highly recommend it to anyone wanting to leave their dog in the safe hands of Jangles. Alfie loves his boys holidays and over night sleep overs with Beau, Mac, Joe & Eddie as well as the other furry guests. He loves his big adventure walks where he can explore and burn off all his energy, he even loved a ride in the Jangles van. I wouldn't leave Alfie with anyone else. Cath knows his needs and treats him like one of her own and takes great care in giving him a home from home environment. It's peace of mind for us knowing our dog is being well looked after. Thank you Cath for all that you do for Alfie. Brilliant home boarding. My 2 were so happy, playing with the resident dogs and cwtching up on the sofas, they practically didn't want to come home with me. I will definitely be taking them to Jangles for their next holidays. Winnie my 5 month old Cockapoo has stayed a few times with Cath at Jangles and I would highly recommend them. It's Home from home for Winnie and is treated like part of the family. Cath is organised and thinks of everything to make Winnie's stay an enjoyable one.